Monday Night Magic in Sheffield! In the meantime, here’s some great news for anyone in the Sheffield area (although it would be worth travelling some distance for!). 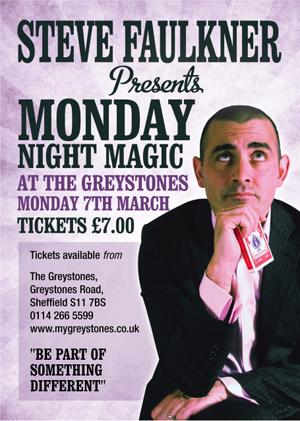 Regular Lounger and all-round magical good guy Steve Faulkner is presenting Monday Night Magic at The Greystones. 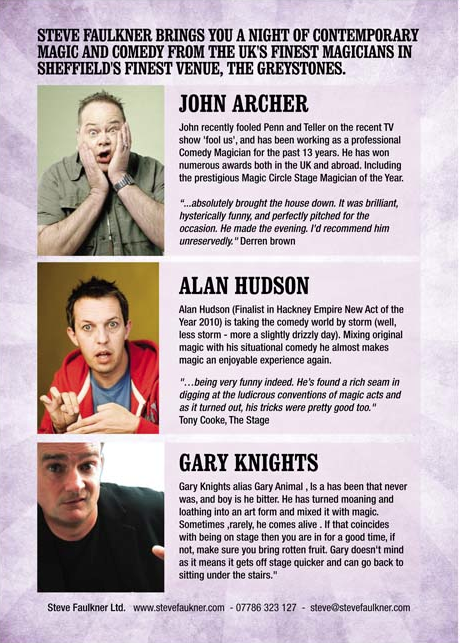 On Monday 7 March he’s got an amazing triple bill lined up for you: John Archer, Alan Hudson and Gary Knights. All for £7… that’s £2 each with Steve thrown in for a quid. Much too cheap for such a quality programme! Tickets are available from The Greystones, Greystones Road, Sheffield, S11 7BS. Click here for their website.